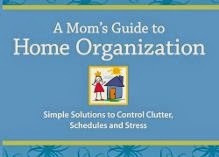 A Mom's Guide to Home Organization is a book providing some simple tasks and easy methods to get de-cluttered, de-stressed and more organized. Organization isn't just about cleaning and space, it includes schedules and time management. Debbie Lillard offers helpful steps and solutions in her book. I really liked her CPR method for decluttering toys and kid things. Categorize, Purge, Rearrange = CPR. I can't say I've arrived 100% since reading her book, but I'm slowly but surely putting her practices in place. I started with small areas of my home--reorganizing and doing CPR on a kitchen cabinet. I did this before I was given the chance to try a new casserole crock pot. Since I had already done CPR there, I had room to rearrange slightly to fit my new crock pot into the cupboard. I focused on my laundry area. It sometimes...umm, always...turns out that my dryer is the dumping ground for everything nobody feels like dealing with on the way in from the garage. So in less than an hour, I was able to do CPR on my laundry room. I'm pretty impressed with what I accomplished--and perhaps a little embarassed that I found I had 'lost' about 4 bars of Fels Naptha soap in there. I use Fels for making my own laundry detergent. As you can see from the bottles, I also found a few commercial bottles of detergent that I didn't know I had. I've since donated some to our church pantry and used one when I didn't have time to make new homemade detergent. I forgot a before with the cupboard open...in part because if I opened it and stepped back to take a photo, who knows how many things would end up falling out on the floor. I'm happy to say I'm now able to leave my cupboard open easily. And after I donated some spares from here, there was even more room for me to organize the cleaning rags. I enjoyed this book and am in the process of rereading in order to continue on my quest for home organization and clutter control. Disclosure: I was provided a copy of this book by US Family Blogger and Space to Spare in exchange for a review. However, all thoughts are my own.